Purchased lightweight towels to take on vacation. They were perfect towels for kids to carry to the beach and dried while hanging on back of beach chair. Large enough for adults and kids. I would highly recommend for adults and kids. This ultra-soft and extremely absorbent authentic Pestamel Fouta towel wrap is made from 100-percent natural cotton hand-woven on ancient looms in Turkey. 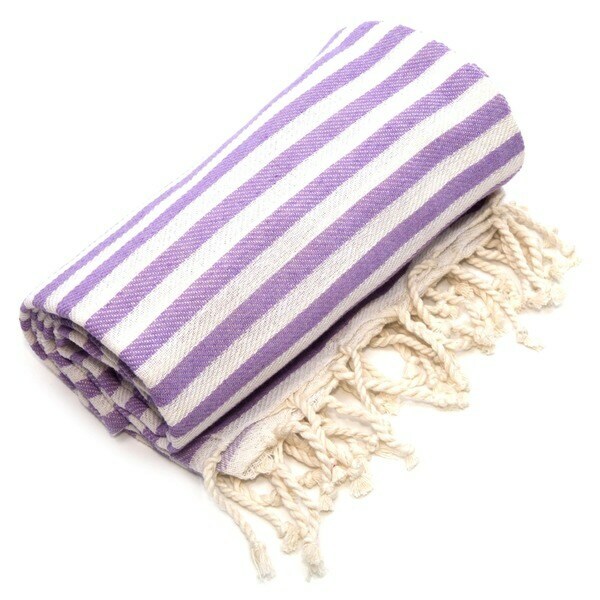 The herringbone weave Fouta towel is lightweight and generously sized. I bought three of these towels in different colors. They are soft and absorbent and they dry quickly. I mostly use them for the beach, pool, and gym, but I've brought them along on a few trips. They can be rolled up tightly and will easily fit in a suitcase or backpack. They are generously sized, as am I, and I can wrap this around me in the locker room and be completely covered. Good purchase. I don't think this is the highest quality towel, but it does the trick. It's a lot less bulky than a regular beach towel and dries quickly. Some of the fibers were loose, so I wouldn't call it perfect. There was also some discoloration, but that went away once it got wet. My wife loves these, they are true to form, they do get softer with each wash, and they resist fading! A real nice color and excellent beach yowel.